Perfect for third grade students, the Cursive Writing Skillbook offers a variety of fascinating penmanship exercises to give students continued penmanship instruction and practice. It includes a thorough review of letter formation with emphasis on correct slant, spacing, and proportion. Activities include phonics review, dictionary skills, and creative writing, the latter of which uses the included Animal Dictionary at the back of the book to write brief reports about selected animals. Grade 3. 5th Edition. 196 pages, softcover. This new edition features minor changes in colors and the addition of a few tracing helps. This edition does not contain the Character Notebook pages that were previously included; students now instructed to compile their character notebook on notebook paper. 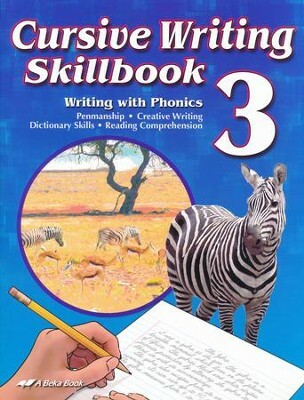 I'm the author/artist and I want to review Abeka Cursive Writing Skillbook Grade 3 (New Edition).